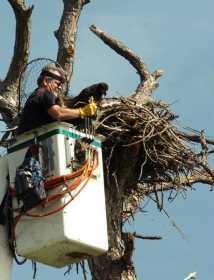 RICK SILVA ~ Associated Press Brian Mealey, president and director of the Institute of Wildlife Sciences, removed one of two baby eagles from its nest Monday in Port St. Lucie, Fla. Scientists attached a satellite tracking device to one of the eaglets. PORT ST. LUCIE, Fla. — Bobby Ginn gave up the nicest lots in his luxury golf course community to a couple that just flew in and made themselves at home. Three years later, Ginn is happy with the deal. So, apparently, are the bald eagles nesting with a multimillion-dollar view: They recently had babies. Some developers would have seen an obstacle in the eagles, sitting in a dead pine tree overlooking a lake and surrounded by acres of nothing but nature. Ginn saw an opportunity not just to protect the environment in one of his latest multimillion-dollar ventures, but to make the eagles a selling point. "For me, it's as big an amenity as golf or tennis or a pool," he said. "People want to see and enjoy wildlife and they should be able to do it from home." Ginn set aside about 120 acres — up to $40 million worth of home sites — in his Tesoro community in Port St. Lucie, about 115 miles north of Miami. The property, next to a lake surrounded by trees was to have been the most expensive property and the only waterfront in a neighborhood where houses are selling for up to $5 million. RICK SILVA ~ Associated Press Brian Mealy right, placed a hood over the eyes of a baby eagle he had just taken from its nest Monday for scientific information with the help of John Baldwin, left, a professor at Florida Atlantic University in Port St. Lucie, Fla. Scientists attached a satellite tracking device to one of the eaglets. They will eventually offer the public a rare opportunity — the chance to track its first flight and daily migration online as it soars from Florida as far north as Canada. The land is now preserved as nature in perpetuity as a conservation easement donated by Ginn and controlled by Audubon of Florida. Ginn has partnered with the group to protect the eagles, and is paying for outreach and monitoring programs out of his own pocket. "Whenever we talk to local governments, other developers and land owners, we cite Bobby Ginn's development as an example of someone who's really done the right thing," said Charles Lee, the group's director of advocacy. "These are the techniques that if Florida's environment is going to survive in the face of population growth that is coming here, more and more developers are going to need to adopt." What's good for the eagles has been good for business, Ginn said. The area's natural beauty and wildlife figure into the marketing of the development. "Wildlife doesn't have to suffer. It can coexist with development," he said. "There's got to be a mix, particularly as we're more and more crowding the planet." The bald eagle was on the federal endangered species list when Ginn started construction, but it was removed last year. Now there are nearly 10,000 mating pairs in the contiguous 48 states, compared to a documented 417 in 1963 when the bird was on the verge of extinction south of Canada. The Tesoro nesting pair's two eaglets hatched about eight weeks ago. A Web camera aimed at their nest allows the public to watch the family in real time. Earlier this week, scientists working with Audubon attached a satellite tracking device to one of the eaglets in hopes of learning more about migration patterns once the bird takes flight in a few weeks. The public will also have a rare opportunity to view what the scientists see by monitoring the eaglet's movements online as it leaves the nest for the first time and flies as far north as Canada. "The more data we have as to where these birds go the better off we are protecting them," said Lynda White, EagleWatch coordinator for Audubon of Florida. "And we've got to find a way to strike a balance between development and preserving the species, since now that they're de-listed, we don't know what is going to happen." This is great, I love these eagles could you send me the Web camera aimed at their nest which allows the public to watch the family in real time.